Have you ever heard about “mutual induction speakers”? I had not, but I’ve just seen one on W2COMP blog, and all your have to do is to place your mobile device on the speaker, and it will amplify the audio vibrations, without any connection or setup required. It should work with any phones or tablets, no need to have a smartphone with Bluetooth or Wi-Fi connectivity. Power – Rechargeable BL-5C, or AA batteries. About 8 hours of audio on a charge. You can also use a power adapter. 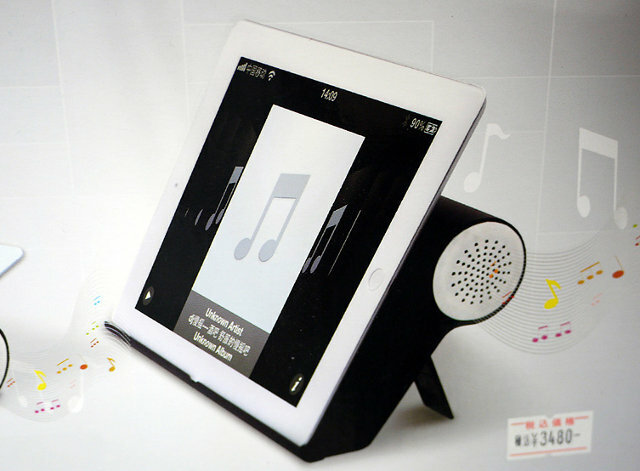 The phone/tablet speakers must faced the surface of the speaker, but if you have a CD player, you can still use the speaker by using an audio cable. You can watch W2COMP demo to see how it works. Denko MP-12 speakers are available for $39.99, but I’ve also found an earlier and smaller model Denko MP-07 that sells for $24.49 on DealExtreme, as well as Aliexpress for $22.